Crochetpreneur > Handmade Business Tips > Crochet Business > Getting Started > How to Turn Yarn into Money – Start a Crochet Business Today! How to Turn Yarn into Money – Start a Crochet Business Today! If you’ve spent any time here on the Crochetpreneur blog, you know that my passion and mission is helping women to build their yarn-based businesses in order to have the financial freedom to create a life they love. If you’re looking to start a crochet business – or grow on that has grown stagnant and struggling – you’re in the right place! My crochet businesses, both my designs and products from Made with a Twist, and this blog and it’s associated products and services, have afforded me the opportunity to work from home in my pjs, to travel extensively with my husband whether to a fancy resort or a backwoods campground (we love it all), and to be the full-time caretaker of our infant grandson while his parents are working. This is the life I’ve always wanted! 1.1 An Impulsive’s Guide to Starting Your Crochet Business Right Now! 1.7 Ready for Something More Advanced? I write for women who want to live life on their own terms, who are tenacious and hard-working and are willing to put in the time and effort to build a business that will bring them the freedom to stay home with their kids or travel or sit around in their pjs all day (or all of these). Whatever success looks like for you, I will be your biggest cheerleader. As a consummate creative, I’ve always been interested in making….making art, making jewelry, making handmade fashions, but I have a variety of other interests as well. I enjoy writing, traveling (as I said, above) and speaking into the lives of women as a psychotherapist and coach. So, I’m just the kind of person who loves doing all-the-things. When I found blogging, it was like I’d hit the jackpot because I can combine all of my passions – helping, writing, and making – into one perfect little business. I used to work my crochet business full-time, but now that I’m a full-time grandma, I’m working in the margins of life – early in the mornings, during naptime, and after dinner – and I still love it. It’s the perfect situation for me and my family! What might be the ideal situation for you? I want you to know that you CAN make money with your crochet talents and skills. Whether you love designing, making products, teaching, or writing…there is a place for you in the world of crochet. You can work online or offline, full- or in the margins of life (like me). Your goals may be big or small. Whatever they are, I’m here to help guide you through the process and help you be as successful as you want to be. An Impulsive’s Guide to Starting Your Crochet Business Right Now! Creatives are notorious for acting on impulse. Sometimes our impulses get us into trouble, but somethings they’re just the thing we need to do something great! If you’re thinking of starting a handmade business and you want to do it NOW, this is the post to help you do it the right way. Have you been wondering how you might make money with crochet? Your crochet business can look any number of ways that are unique to you! Check out this ultimate list and mix and match your skills and passions to create your perfect business. Often, creatives are plagued by procrastination when it comes to the business side of their business. We want to make and we want freedom, but these tasks must get done. Here’s how you can crush all those tasks you’ve been avoiding. When someone asks what you do, do you tell them “I sell crochet”? If so, you just may be sabotaging your business. Find out what to do and say instead that will draw your customers to you and boost your sales! Are you ready to jump into the world of handmade business? This post will walk you through all the steps you need to get it done and get on your way to making money. There’s no better way to gain credibility and increase visibility for your crochet business than by starting a blog. Whether you’re sharing behind the scenes details of your business, posting patterns or, even, lifestyle tips for your ideal customer, blogging is a great primary or secondary source of income for your crochet biz! Have you worked your way through all those beginner posts and you’re ready to dive deep into your business, peruse these posts for more tips and tricks for building your profitable (and awesome) crochet business. Just hover over the image of the post you’d like to visit and click on the LINK button in the center. Don’t miss this opportunity to have access to all of my free business resources. Click the image, below, to sign up for the resource library and receive my weekly newsletter with tips, encouragement, patterns, and more resources for success! 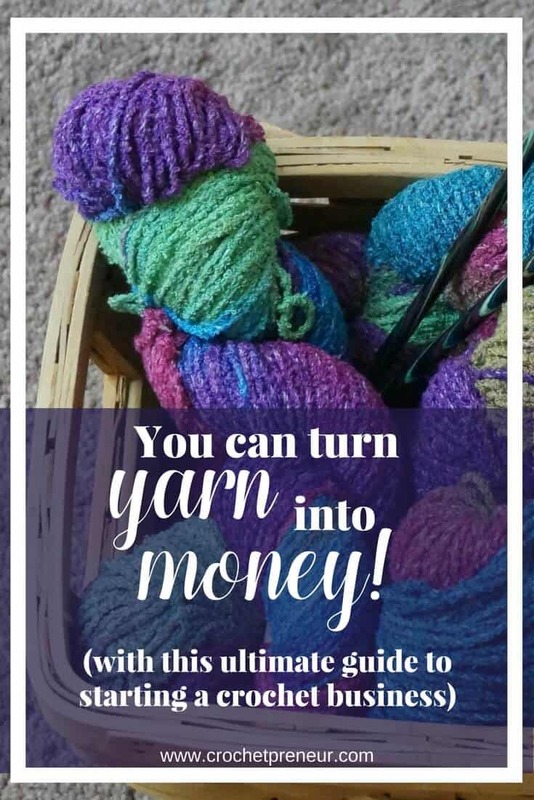 Bookmark this article How to Turn Yarn into Money – Start a Crochet Business Today!